Payphone booths are a relic of the past — yet another victim to technology's rapid advances — but an upcoming community art project seeks to give the booths new purpose through storytelling. The West Central Dial-A-Story Project is spearheaded by the Kendall Yards literacy and resource nonprofit Spark Central, with support from Spokane Arts, Laboratory Spokane and the Spokane Civic Theatre. But before this exciting, original project can become a reality, contributors of all ages are invited to submit their West Central-centric stories. February 19 is the deadline to submit true, first-hand experiences set in or associated with the neighborhood. Then, 30 stories will be chosen and made available for public listening at three phone booths installed in the historic West Central neighborhood. Project organizer and executive director of Spark Central Brooke Matson says the project seeks to share stories from West Central residents past and present, as well as students, employees, business owners and anyone else who spends time there. You don't have to be a resident of West Central, however your story should have an obvious connection to the place. 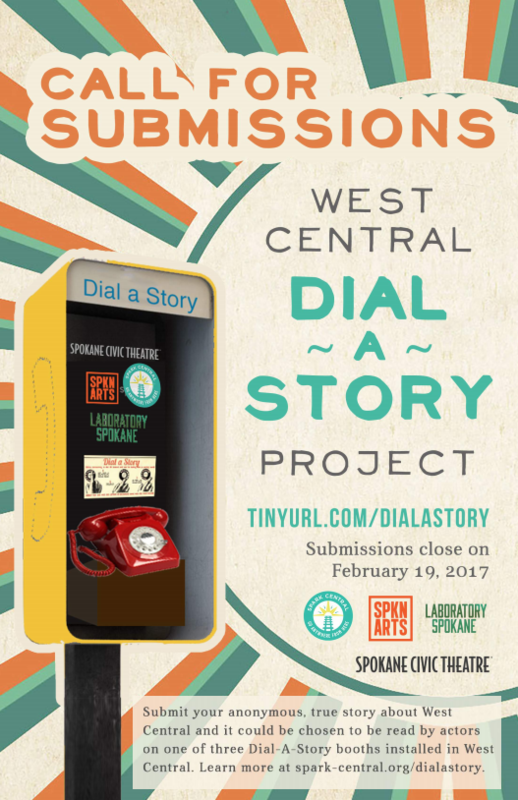 Specific requirements for Dial-A-Story submissions are outlined in more detail online. After stories are selected, recorded and programmed for the booths using Raspberry Pi technology, with the help of Laboratory Spokane, they'll be installed at public places this spring. Spokane Civic Theatre actors are set to contribute their talents for some of the voice recordings to create dramatic monologues. Visitors to the booths will be able to use a numerical dial pad to select a story to listen to. The plan is to have the three booths on display for several months this spring and summer, but possibly longer depending on the community's reaction. STCU is sponsoring the project; Spokane Arts acquired the needed phone booths for the installation some time ago. "It's interactive and I love the storytelling aspect of sharing true stories from a wide range of voices," Matson says. The West Central Dial-A-Story Project has been a long-envisioned goal for Matson and former Spokane Arts director Laura Becker. They'd begun planing for it to happen sooner, but the story submission process was relaunched this winter because of slow responses when it was originally introduced last summer.